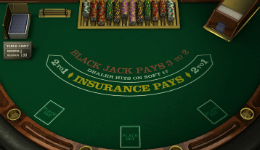 While top online casinos these days offer a plethora of Blackjack variants, it is important to note that most of these games are based on either European or American blackjack. The American version, played in casinos across Las Vegas and also available at certain online blackjack sites, is at the centre of our attention here. Actually, in most cases, American blackjack is referred simply as blackjack. It’s kind of a default game on which different variations are based. Nevertheless, there are some casinos that offer specifically American blackjack game. Online, there are three of those developed by different software providers: Playtech, SkillonNet and BetSoft. 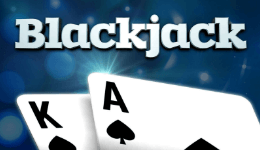 You can play all free blackjack games here below. Available in single-hand and multi-hand mode, American Blackjack resembles its European counterpart in many ways, but it is the dealer’s hole card that separates the two. Namely, rather than receiving his second card after the player has finished his hands as it happens in European blackjack, here the dealer gets his hole card before the player can make his first decision and this makes all the difference to the gameplay and your winning chances. Why it matters? Simple. In American version, in case the dealer has an Ace (and sometimes 10) card, he checks for blackjack. If he indeed has 21, the game ends. In European variation, he obviously can’t do that, therefore your risk is higher: you may split or double, just to loose everything to dealer’s perfect hand. 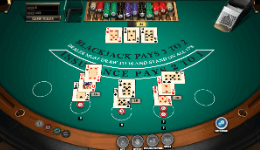 Below you can find some free American blackjack variations. American Blackjack tends to follow Las Vegas Strip rules, with minor exceptions that depend on the variant you are playing. 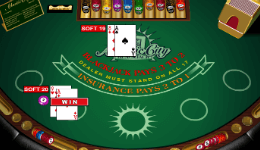 All American Blackjack titles are called hole card games and the most popular versions include Vegas Strip, Atlantic City Blackjack, and even more unique titles such as Double Attack and Progressive blackjack. The hole card rule can be beneficial for the player due to the fact that you will lose only your initial stake if the dealer has blackjack rather than splitting and doubling your hands only to find out later that it had been a bad decision. On top of that, you will know that the dealer does not have blackjack before making your decisions and this should also increase your winning chances. As a game of chance, Blackjack can get the better of you no matter how well you play, but players do have an opportunity to improve their winning chances by following the basic strategy and advice from experienced gamers. You should always bear in mind that if it is your turn to play, the dealer definitely does not have blackjack, and you can, therefore, play with more confidence and adopt a somewhat riskier approach than you would normally. 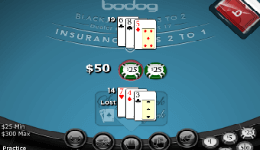 When dealer’s face card is 6 or lower, you should stand even when you have what is normally considered a weak hand, due to the fact that the dealer will be forced to draw another card if he gets a ten-value card, meaning he is more likely to bust. Doubling down on 10 or 11 when dealer’s face card is nine or lower is usually a good idea, but certain versions do not allow hitting after doubling down, and you need to be more careful when playing such titles as you will not always get a ten-value card after doubling down.